Long story short, folks: if you're gonna write something long, whatever application you use, just remember to save it early and often... lest the program crash and take 1,500 words with it. More once the rest is re-written... but for now, one of the more dramatic -- and, indeed, consequential -- outbreaks of Vatican intrigue in memory has taken a new turn today with the report that Cardinal Marc Ouellet, the 66 year-old archbishop of Quebec and primate of Canada, is now expected to be named prefect of the Congregation for Bishops "in the coming weeks" upon the retirement of Cardinal Giovanni Battista Re. Relayed by the most reliable of the Italian "court scribes" -- Il Giornale's Andrea Tornielli -- the leak caps a stunning turnabout that, but six weeks ago, saw Sydney's Cardinal George Pell preparing to take up the all-powerful post overseeing the global episcopate and, above all, recommending its next members to the pontiff. Already having been earmarked a Roman apartment, while the Aussie strongman's age and health were cited widely in the Italian press as the causes behind the switch, Saturday's La Stampa reported that the circulated rationale provided a "diplomatic veil," under which lay concerns over a 2002 accusation of abuse against Pell dating to the early 1960s, which was deemed unestablished at the time after an inquiry backed by the Australian church, but led by a retired, non-Catholic High Court judge. While the daily's Marco Tossati wrote that -- likely due in part to the fierce internal opposition toward Pope Benedict's "Australian project" -- fear suddenly circulated in the Vatican that "the presumed victim could decide to open judicial proceedings," the complainant in the 2002 matter has never been heard from since the inquest's close. What's more, the accuser's attorney made clear at the time that his client would seek no criminal or civil redress in the case and was satisfied with the process' result. On making his allegation, the accuser had been "urged" by church officials to report the claim to the civil authorities, but declined. After the inquiry, the charge was essentially forgotten... that is, until recent weeks. Looking forward, though, the latest presumptive pick to enter the Vatican's "Big Three" and head up the celebrated Thursday Table that votes to recommend episcopal appointees to the pontiff has long enjoyed Benedict's high regard and solid trust. A veteran of the Communio school (and still a member of the journal's editorial board), Ouellet is no stranger to the Curial world. 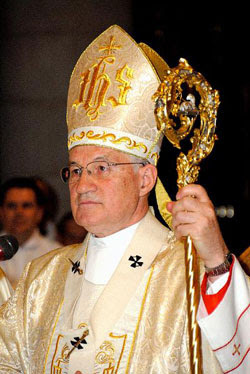 A product of the Gregorian and onetime professor at the Lateran, in 2001 the dogmatic theologian was ordained a bishop and made secretary of the Pontifical Council for Promoting Christian Unity, from which post he was sent back to Canada's mother-see 18 months later and, within a year, given the red hat long denied his predecessor. 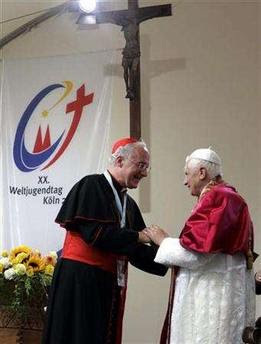 In the time since, among other things, the Sulpician was touted as papabile at the 2005 Conclave, won high marks for his turn as relator (spokesman) at the 2008 Synod of Bishops dedicated to the Word of God, and has been spoken of since this pontificate's early days as a member of B16's "kitchen cabinet." Over recent weeks, the cardinal's been at the center of a heated debate over abortion up North, one sparked after he echoed church teaching by calling the procedure a "moral crime" irrespective of its circumstances. After protests ensued from politicians and women's groups and he was branded an "ayatollah" in the press, Ouellet said that "there is a legitimate debate about promoting human life, about respect for the unborn." Canadian society "is very weak on that," he added. A forceful voice in a Quebecois square where he recently observed that "the church... has no power anymore," the cardinal's resume likewise includes extensive experience in the secondary area of competence long entrusted to the oversight of the Congregation for Bishops, having served a decade in South America as a student, professor and seminary rector in Colombia. The prefect of Bishops has simultaneously held the presidency of the Pontifical Commission for Latin America since 1969. Ouellet is already a longtime consultor to the Southern task-group. That's where it's at for now... and especially given the turns this one's taken, it bears repeating anew that barring the Bollettino in hand, anything, and everything, can change. Pope to Priests: "Become a Wellspring"